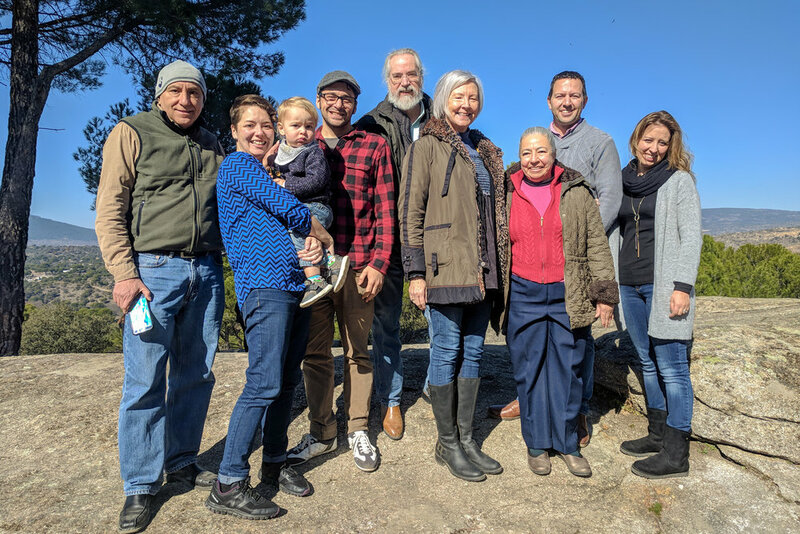 Pictured here are Mennonite Mission Network's Spanish workers during the regional gathering of Anabaptist church leaders in February: (from left) Francisco Machado (Madrid), Alisha, Asher, & Joshua Garber (Barcelona), Dennis and Connie Byler (Burgos), Juana Machado (Madrid), Brian & Noelia Fox (Burgos). In terms of global missions, European workers are certainly underdogs. Organized religion is generally viewed as being a societal relic and yet so many churches seem to continue doing things the way they always have. You put on your best suit or nicest outfit. Comb your hair. Brush your teeth. Practice your smile, greeting and rehearse your handshake… When you get into the interview room you try to look confident and poised and prepared. You've already researched the company and position, and you're ready you take the job. You've finally made it to the end of your interview and they shake your hand, flash a big smile and welcome you to the team. *whew! * You've made it! You got the job. Then they walk you to your new office… Wow. This is so great! But as you pass through the doorway, you notice a problem. You only interviewed for a position answering phones, and now you're running the company? You're not qualified for this! What were they thinking? And why is that? Because they're unqualified! Their CV doesn't meet the job's requirements. So why is it that we don't always recognize so many Biblical heroes start as underdogs? God used ordinary people to show His extraordinary goodness. When Jesus was on earth, he surrounded himself with underdogs -- misfits, outcasts, and societal losers. Feel like the odds are against you? You’re in good company. In Mark 14, Jesus tells his disciples to go into town, find the “man carrying a jar of water,” and follow him to his house where they would celebrate the Passover meal. The Bible never mentions this man again. We don’t know who he was, why he was chosen, or how he knew to meet the disciples. The man with the water jar was the epitome of an underdog: unknown and seemingly unimportant. But, because he obeyed Jesus without question and offered his home, he left an impact on history. Little did he know his home would be the location of Jesus’ last meal on earth. In John 6, Jesus uses the faith of a little boy to feed more than 5,000 people. The boy in this story had very little food: only five loaves of bread and two fish. This was probably just enough for him to eat that evening. However, he had faith that Jesus used to create something extraordinary from something very ordinary. Because this underdog of a boy gave Jesus the little that he had, a remarkable miracle took place. In 1 Samuel 16, God sends Samuel to anoint a new king. He arrives at Jesse’s house but, as he meets with Jesse’s sons one by one, he realizes none of them are the one God sent him to anoint. When Samuel asked Jesse if there were any other sons, Jesse said there was still the youngest son keeping sheep in the field. Basically, Jesse was saying, “Yeah, I have one more son, but he’s the youngest and he’s an unremarkable shepherd. Obviously he’s not going to be king, so I didn’t even bother asking him to come up here to meet you.” More more simply put, there's no way underdog David could be a king. But God wanted David, regardless of the odds working against him. It's not a coincidence God chose the youngest, smallest, and most unlikely member of Jesse’s family. From killing giants with pebbles and leading a nation as king, God turned underdog David into one the greatest heroes of the Bible. These are just a few examples of hundreds...and these are just this tip of the iceberg when you consider these are just the recorded Biblical underdogs. Imagine the countless underdogs used through history! I share this as a message of encouragement: if the odds are against you, your religious resume feels bland, or you simply feel unremarkable, take hope and remember: God is in the business of using underdogs just like you.